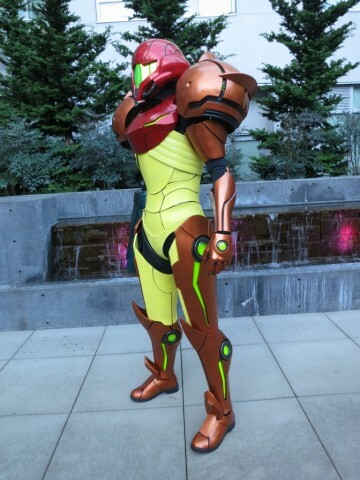 3D Printed Samus Aran Costume #3DThursday #3DPrinting « Adafruit Industries – Makers, hackers, artists, designers and engineers! Replica Props Forum user Talaaya, a.k.a. 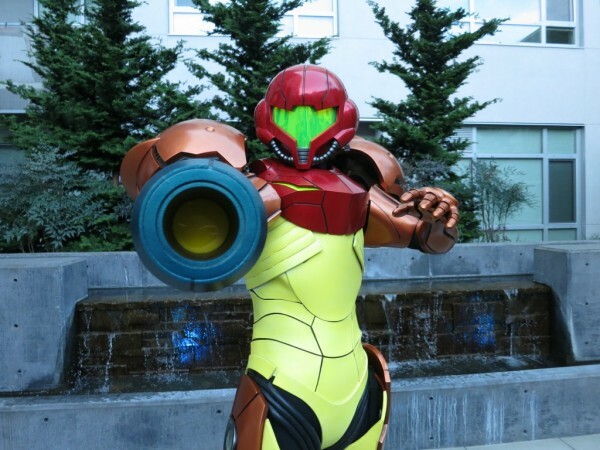 Chelsea, used the benefits of 3D printing to her advantage with this impressive Samus Aran costume. She worked with her friend Matt Serle to print the armor pieces of the bounty hunter’s costume, and it took hundred hours of printing plus about the same amount of time for post processing each piece to make it as smooth and accurate as possible. One of the challenges she faced was breaking down the armor into small pieces since the bed of the printer she used – a Zcorp 450 – is only 8″ x 10″ 8.” Yeah, she had to glue a lot of armor and helmet sections together. Chelsea documented the entire build with detailed notes at her blog, and it’s fascinating to watch the plans evolve. She started the Samus Aran project in January 2012, and back then she waas considering making the armor from resin. Over two years later, the costume is finished and you can scroll through her blog to see the intense amount of work that went into the build. 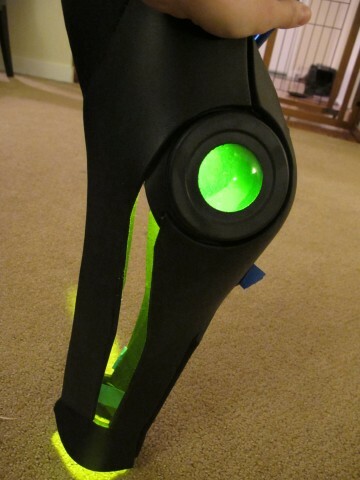 A while back I bought a green vinyl film which I intended to use to color the straight lit sections on the legs and other areas. I wasn’t sure how to do the domes since I didn’t think the film would work on such compound curves. I tried all sorts of other stuff like using Pledge Future Shine and food coloring, and just straight up painting. Neither were anywhere close to ideal. Tonight I decided to see if I could make the film work on the domes. It’s really, really difficult, but it does indeed work!! Yay! In the picture I’m lighting the shin with an LED flashlight which has a yellow covering on it. After seeing how nice the yellow looks, I think I’ll switch to yellow LEDs instead of using actual green LEDs like I originally planned. Makes it look much more lime green as it should.